Who Wants Funnel Cake?.... I Do...I Do! We top our Funnel cakes with delicious Powdered Sugar, Whip Cream, Ice Cream, Chocolate, Caramel, Butterscotch and Strawberry toppings. We also use Nuts, Sprinkles and Chocolate Chips to give your funnel cake that extra goodness- That's so hard to resist! Our Motto is... "Who wants Funnel Cake... I Do... I Do! Give your birthday party, wedding, family reunion, corporate event, church picnic, trade show or fundraiser that unique touch with The Funnel Cake Man. We travel to your specified location and make fresh funnel cakes on site. We are equipped to handle large and small events. We cater to you and offer a wide variety of options to customize your event to your specific needs! 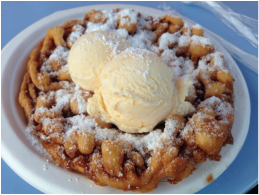 Our funnel cakes are home made and never pre-packaged. We make our funnel cakes fresh on-site! We have a wide variety of toppings and specialty options! 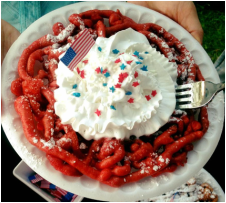 Every event is different but all events deserve that WOW factor from The Funnel Cake Man. We can customize your event to your precise specifications! Feel free to contact us in order to book your event or inquire about our services! We are more than willing to answer any questions you may have!